Yesterday was another big achievement for Trackener : we launched a free standalone app to enable anyone to track all their rides! The app is available on the app store here and will be available soon for Android as well. After a month of intensive work on the development of the app for Jeremie (and I'm very thankful for the amazing work he did for his first ever iOS app) it's great to have something to share with a wide audience before opening the sales for our device in a few months. We're convinced that there is a lot to be learnt by releasing publicly an app as teaser of what our final product is about. from a technical point of view this app was a great way to start migrating our "real app" (connected to our device) into a mobile app. So even if we had to push back some more development on our real app, it will make us be able to deliver quicker our final app. the software development was anyway quite limited until we get some more devices to collect some more data. So it wasn't too risky to stop this and spend time on the app development for My Hackathon. it's always good to show to mentors and potential investors that we can deliver a finished product on time (we committed to a deadline for the charity to be able to share it with their participants). there is tons we can learn from releasing a simple app for free and from the feedback we get before actually having paying users for our final real app. The idea behind this app is to give access for free to as many horse owners as possible to the simplest tool to keep the horse fit and healthy: an app to keep an eye on the quantity of exercise the horse is really having. Too many domesticated horses are overfed and not enough exercised. 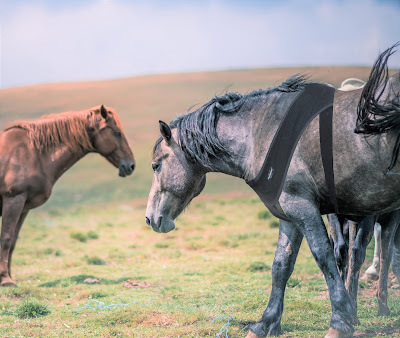 So it is part of our mission at Trackener to help the horse owners find the right balance of feed quantities and of exercise they should give to their horse to keep them perfectly healthy. This app is a first step towards this goal. We're very much looking forward to learn from our app users about how we can give them the best tools to improve the health and welfare of their horse through optimal exercise. 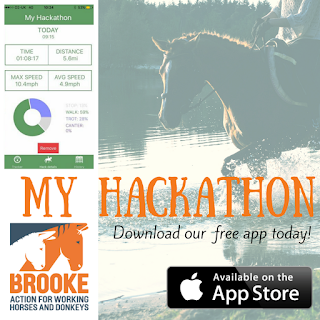 So if you have a horse please download our "My Hackathon" app (soon to be renamed "Trackener Ride") and give us your feedback! And of course spread the word around you! Thanks for reading and for sharing.